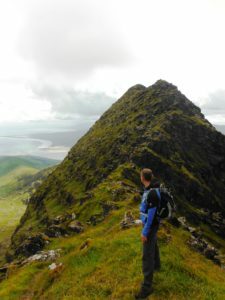 Guided hikes,scrambles and climbs of Mount Brandon, Dingle peninsula. 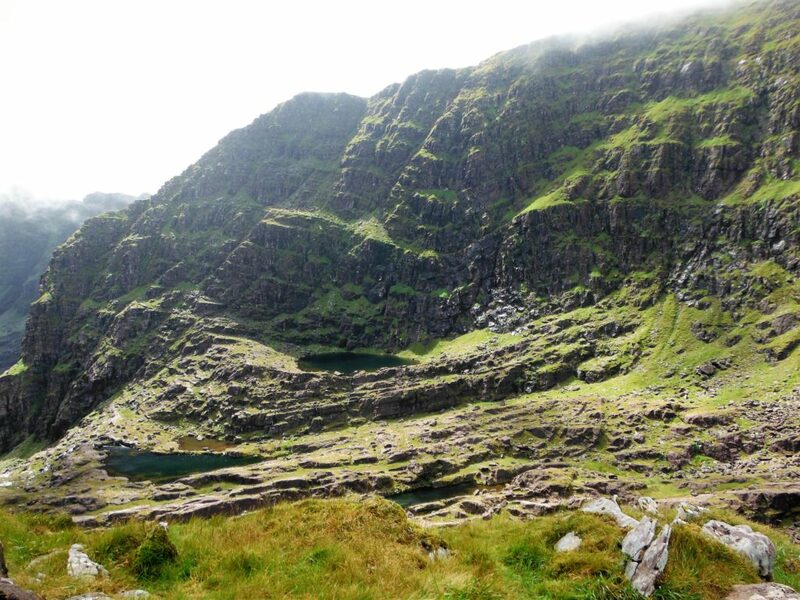 In the whole of Ireland there is no place that has such a wealth of historical monuments, Gaelic culture, literature and spectacular rugged scenery than can be found on the Dingle Peninsula. The Sliabh Mish and Brandon massif form a backbone to the peninsula, and Brandon is regarded by many as the very finest mountain in Ireland. Views from here on a fine day (or even not so fine) will rival the most beautiful & best to be found anywhere in the world!!! Named Brandon Mountain on Irish Ordnance Survey maps, it is called “Sliabh nDaidche” in Beatha Bhréanainn, St.Brendan’s Life within the Book of Lismore (ancient Gaelic manuscript). Here it is written that St. Brendan spent three days on the mountain and that he was visited by an angel. 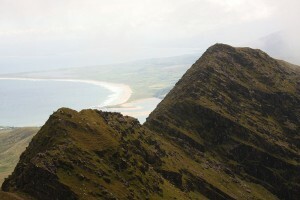 It is described as being surrounded by the ocean, which fits well with the topography of Mount Brandon. Due to this, it has many pilgrim routes to its summit. Because Brandon Mountain is so close to the sea, its full height is fully appreciated and the panorama of sea and landscape is truly awe inspiring. 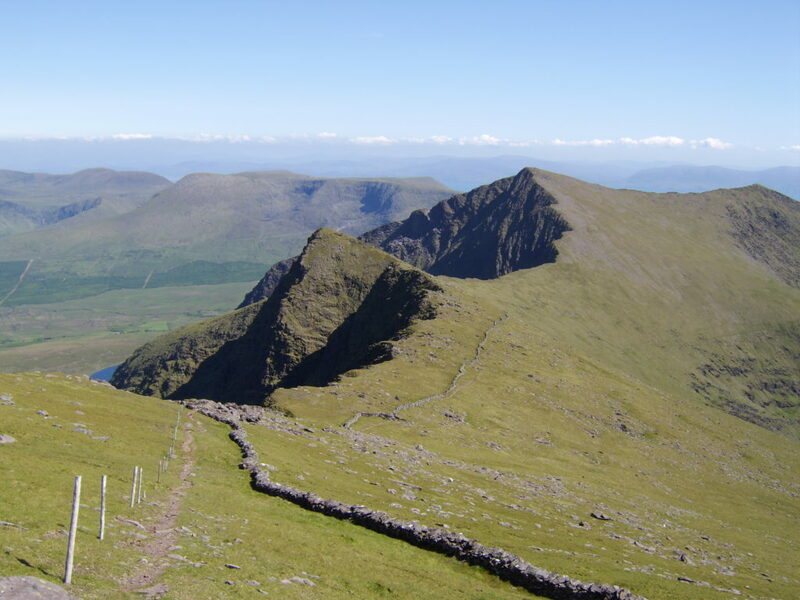 Brandon is the highest mountain in the Brandon Group and the 9th highest in Ireland. 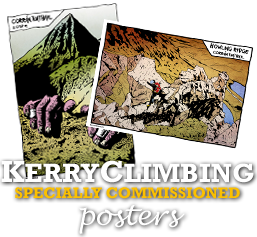 Note : All our various ascents of Mt. Brandon start from a small parking area approx. 2 ½ km from the village of Cloghane, on the north of the Dingle Peninsula. Own transport is required. Brandon via the Patternoster lakes/Esk route. 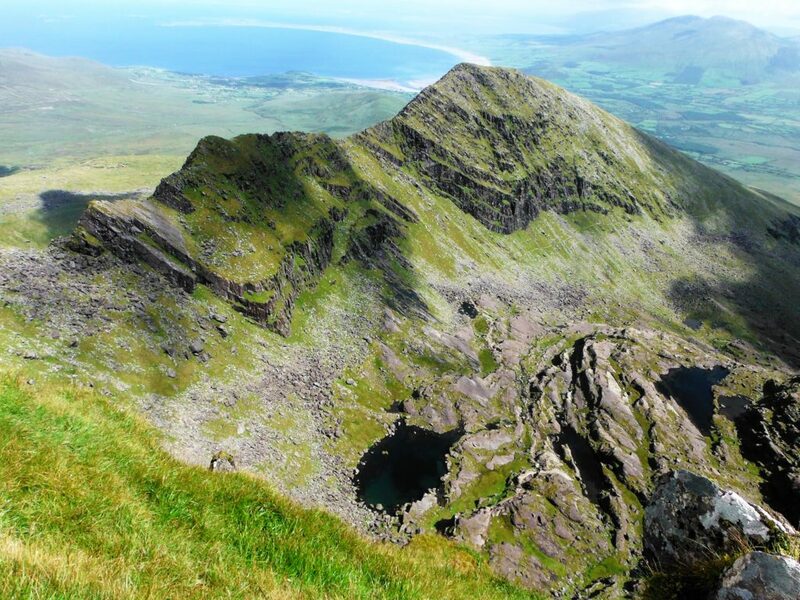 Mount Brandon is the highest mountain in Ireland outside of “The MacGillycuddy’s Reeks”. There is an other-worldly quality to its lofty summits. 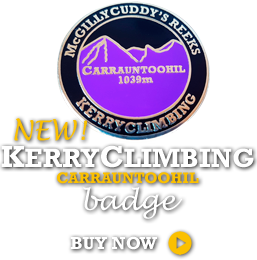 This walk takes in two of the ranges finest and is an enjoyable and exhilarating days trekking no matter what the weather!!! We will begin our walk from a small parking area approx. 2 ½ km from the village of Cloghane, on the north of the Dingle Peninsula. A steep grassy path leads us up hill to reach a small grotto. This haven of peace and contentment is a spot to pause at for a few minutes to absorb the tranquil atmosphere and perhaps benefit from some quiet private reflection on the climb ahead!!!! From here another well used path continues to lead us up hill and height is quickly gained along a gradual traverse. 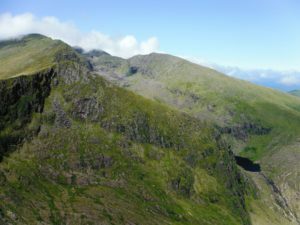 As the upper gradient begins to slacken off we begin to get nearer to the vast coums and cliff faces which form the exposed, easterly faces of the enormous land mass of Brandon Peak and Brandon Mountain ( Cnoc Bréanainn ), the sheer size and majesty of these mountains can be fully appreciated. We are now in the magnificent Owennafeana River Valley and towering above us to our right are the rocky slopes and steep cliffs of the fantastic scrambling route d the “Faha Ridge” a future objective perhaps!! Situated high on this ridge above us at an elevation of almost 800mtrs is one of the highest located ring forts in Ireland. Ring forts are circular fortified settlements that were mostly built during the Iron Age (800 BC–400 AD). At this point the first of several lakes appears to our left. These are called “patternoster” Lakes and what sight to behold!!! A paternoster lake is one of a series of glacial lakes connected by a single stream or a braided stream system. 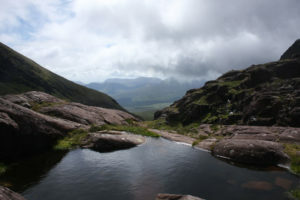 The name comes from the word Paternoster, another name for the Lord’s Prayer derived from the Latin words for the prayer’s opening words, “Our Father”; Paternoster lakes are so called because of their resemblance to rosary beads, with alternating prayer beads connected by a string or fine chain. Paternoster lakes are created by terminal moraines, or rock dams, that are formed by the advance and subsequent upstream retreat and melting of the ice which occurred during the last two ice ages approx. 300,000 – 130,000 and 80,000 to 10,000 years ago. The route now becomes steeper and requires us to scramble up a loose gully of sorts, taking care on this final steep section. This brings us to a point at 810mtrs. We will now walk south to the summit of Brandon Mountain approx. 500mtrs. away. Here we will take a well earned break during which, information on history, geology, flora and fauna will be given while we revel in our surroundings!!! On our way again we will begin to make our way back to the path and carefully descend the way we came. 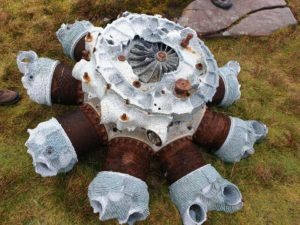 After again resting at the lakes we will continue our descent, stopping off en-route to have a look at the engine of a WW2 German airforce plane that crash landed on the lower slopes way back in 1940. 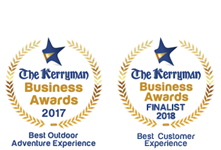 Here we will tell the fascinating story of that fateful event of the entire crew surviving to then be taken prisoner and spend the remaining years of the war interred in the POW camp of the Curragh in Kildare. With weary legs and a great sense of accomplishment we make our way back to the car park approx 2 ½ km from the lakes. What a truly magnificent day in majestic mountains. This trek begins gently at first as we make our way up a distinct spur which soon becomes more rocky and exposed. After approx 1 ¾ km we will come to the fascinating ruins of an ancient ring fort situated at a height of almost 900mtrs. Ring forts are circular fortified settlements that were mostly built during the Iron Age (800 BC–400 CE), although some may have been built as late as the Early Middle Ages (up until ~1000 AD). The views to our right are of the stunning Owennafeana River Valley and to our left, the spectacular Patternoster La kes nestled under the vertical cliffs and ridges of Brandon – what a location and a sight to behold (weather permitting!!!). From here we can also pick out, far below us to our right, the track which we will use on our return later. The route now becomes a lot steeper and requires us to scramble our way carefully along the ridge. 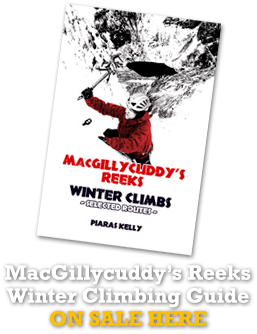 We have a choice of how difficult a scramble we wish to pursue with easier and less difficult options always presenting themselves along the route. We will descend left to a col before a knife edge section. From here we will climb another short but steep section which brings us to a spot height at 891mtrs and now trek south to the summit of Brandon Mountain approx. 500mtrs. away. On our way again we will begin to make our way back to the path and carefully descend steep ground following another path into the coum where the beautiful Patternoster Lakes begin. A Paternoster lake is one of a series of glacial lakes connected by a single stream or a braided stream system. The name comes from the word Paternoster, another name for the Lord’s Prayer derived from the Latin words for the prayer’s opening words, “Our Father”; Paternoster lakes are so called because of their resemblance to rosary beads, with alternating prayer beads connected by a string or fine chain. Paternoster lakes are created by terminal moraines, or rock dams, that are formed by the advance and subsequent upstream retreat and melting of the ice which occurred during the last two ice ages approx. 300,000 – 130,000 and 80,000 to 10,000 years ago. We will continue to follow the track which we noted on our ascent of the ridge, now towering high above us on our left. With weary legs and a great sense of accomplishment we make our way back to the car park approx 2 ½ km from the lakes. 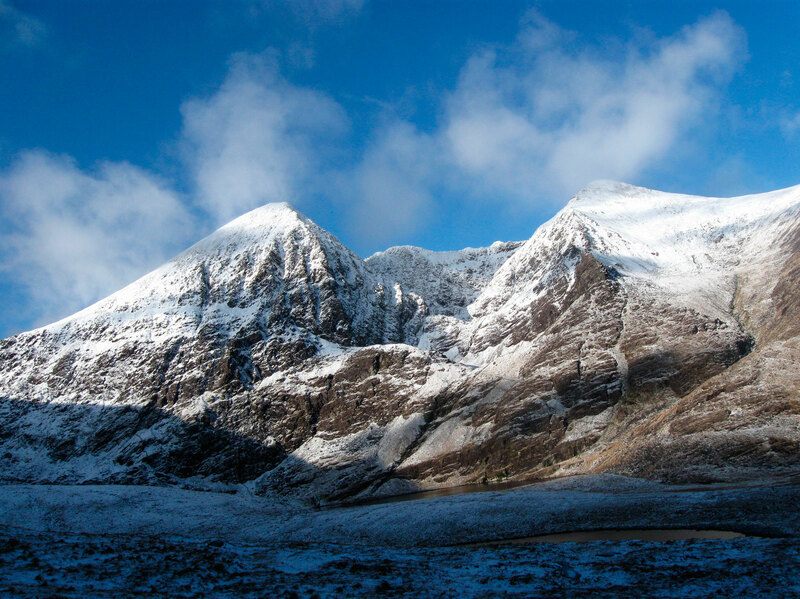 What a truly magnificent day in majestic mountains.